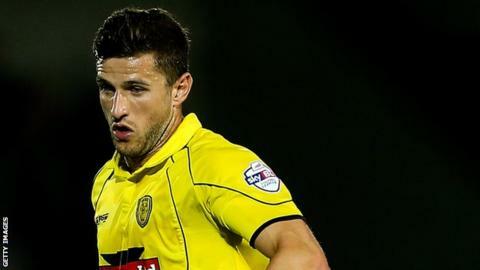 Burton Albion stayed top of League Two and ended York City's 23-game unbeaten run with their sixth win of the season. Burton came close when Michael Ingham punched to John Mousinho but his effort was headed off the line by Keith Lowe. The Brewers did take the lead through Lucas Akins' volley after Adam McGurk's shot had been blocked by Lowe. McGurk hit the bar before Mousinho powered in a low effort from 25 yards to give manager Gary Rowett a win after turning down Blackpool in midweek. The victory leaves Burton with the only unbeaten record in League Two and a three point cushion at the top of table. "It was a difficult game and I knew it would be. I'd been slightly concerned with one or two things this week that might have just taken their eye off the ball. "You're talking about a team that hadn't lost for about 23 games in the regular league season, so to do what we did against them shows how potent we can be when we play well and when we do the right things. "I thought there were lots of excellent performances again." Match ends, Burton Albion 2, York City 0. Second Half ends, Burton Albion 2, York City 0. Foul by Shane Cansdell-Sherriff (Burton Albion). Jake Hyde (York City) wins a free kick on the right wing. Substitution, Burton Albion. Matthew Palmer replaces Adam McGurk. Attempt missed. Michael Coulson (York City) right footed shot from outside the box is close, but misses to the right. Attempt saved. Russell Penn (York City) right footed shot from outside the box is saved in the centre of the goal. John McCombe (York City) wins a free kick in the attacking half. Attempt missed. Jake Hyde (York City) right footed shot from the right side of the box is just a bit too high. Substitution, York City. Tom Platt replaces Lindon Meikle. Substitution, Burton Albion. Marcus Harness replaces Alexander MacDonald. Goal! Burton Albion 2, York City 0. John Mousinho (Burton Albion) right footed shot from outside the box to the bottom left corner. Attempt saved. Wes Fletcher (York City) right footed shot from the centre of the box is saved in the bottom right corner. Substitution, Burton Albion. Jacob Blyth replaces Stuart Beavon. Corner, Burton Albion. Conceded by Keith Lowe. Attempt saved. Adam McGurk (Burton Albion) left footed shot from outside the box is saved in the centre of the goal. Attempt missed. Lindon Meikle (York City) left footed shot from long range on the left is close, but misses to the left. Corner, York City. Conceded by Robbie Weir. Adam McGurk (Burton Albion) hits the bar with a right footed shot from outside the box. Attempt missed. Lucas Akins (Burton Albion) left footed shot from outside the box is close, but misses to the right. Attempt saved. Lucas Akins (Burton Albion) left footed shot from outside the box is saved in the bottom left corner. Hand ball by Lindon Meikle (York City). (Burton Albion) wins a free kick in the defensive half. Foul by Wes Fletcher (York City). Attempt saved. Russell Penn (York City) right footed shot from the centre of the box is saved in the top centre of the goal. Substitution, York City. Jake Hyde replaces Anthony Straker. Corner, York City. Conceded by George Taft. Corner, Burton Albion. Conceded by Marvin McCoy. Attempt saved. Luke Summerfield (York City) right footed shot from outside the box is saved in the centre of the goal. Corner, York City. Conceded by Shane Cansdell-Sherriff. Attempt missed. Alexander MacDonald (Burton Albion) right footed shot from the right side of the six yard box is close, but misses the top right corner from a direct free kick. Alexander MacDonald (Burton Albion) wins a free kick in the attacking half.